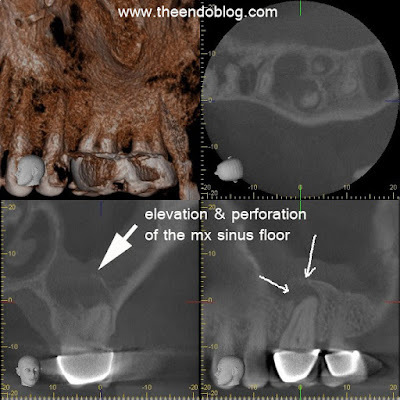 As endodontists, the use of CBCT (Cone Beam Computed Tomography) has allowed us to cross this barrier and diagnose dental pathology which is adversely affecting the maxillary sinuses. These images also allow us to communicate more effectively with patients and physicians who are trying to manage and treat these chronic sinus issues. In order for dental and medical specialists to work together, new paths of communication must be developed. 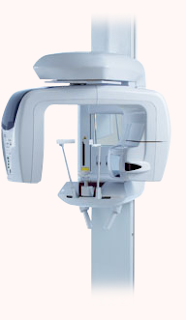 CBCT (3D imaging) is helpful in bridging the communication gap between dentistry and medicine. CBCT (J. Morita Veraviewepocs 3De) demonstrates a large periapical radiolucency around the buccal roots of #15. The sagittal view shows elevation in the floor of the sinus (halo effect). 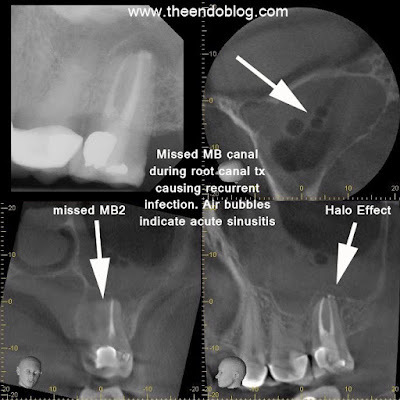 Coronal view shows arrow pointing to a missed mesio-buccal canal causing the endodontic infection. Air bubbles seen in the maxillary sinus are indicative of an acute sinusitis. Endodontic retreatment is required BEFORE sinus treatment. 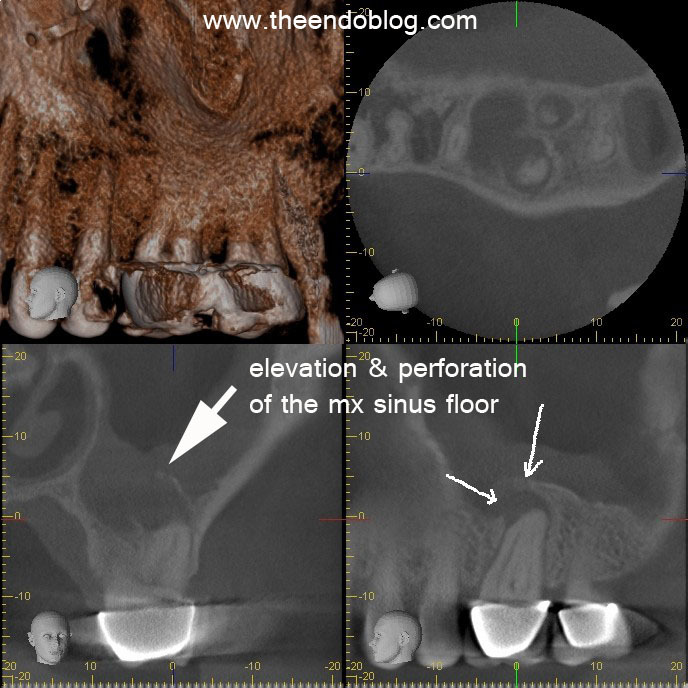 Failure to address the odontogenic source of the sinus infection will result in recurrent sinus infections. CBCT (J. Morita Veraviewepocs 3De) demonstrates a large periapical radiolucency around the mesio-buccal root. The sagittal and coronal views both show elevation in the floor of the sinus (halo effect) as well as perforation of the floor of the sinus. Endodontic treatment is required BEFORE sinus treatment. Failure to address the odontogenic source of the sinus infection will result in recurrent sinus infections. CBCT (J. Morita Veraviewepocs 3De) demonstrates a large periapical radiolucency around the buccal roots of #3. The sagittal and coronal views both show elevation in the floor of the sinus (halo effect) as well as perforation of the floor of the sinus. Endodontic treatment is required BEFORE sinus treatment. Failure to address the odontogenic source of the sinus infection will result in recurrent sinus infections. 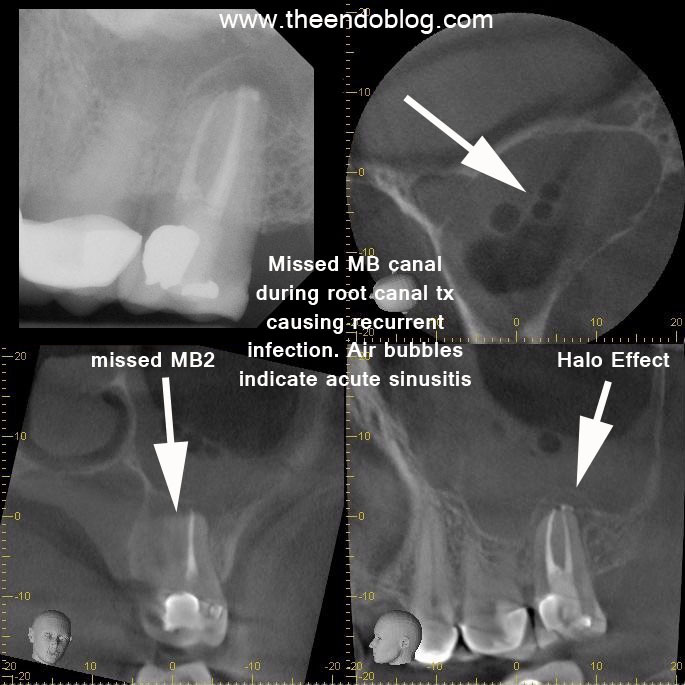 Proper endodontic treatment of the dental infection is the first step in addressing the chronic sinusitis of odontogenic origen. 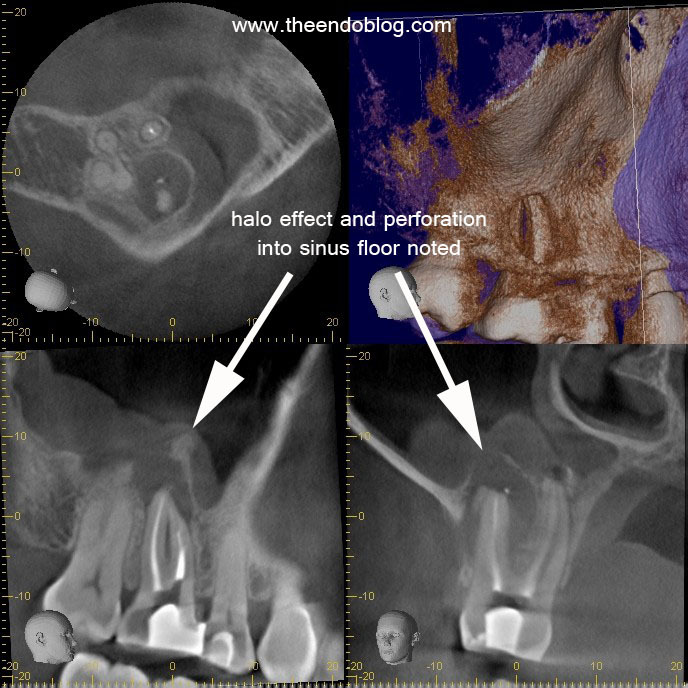 If sinus symptoms persist, following endodontic treatment, then referral to ENT is recommended.